The DAC-1412 is a 14-bit D/A converter that offers up to 125MHz conversion rate from a segmented current source topology that is built on an advanced CMOS process and delivers a low glitch energy output from 2mA to 20mA. Housed in a small 28-pin plastic TSSOP package, it is the best choice for all military, airborne, and aerospace applications that can utilize a low cost Commercial-Off-the Shelf (COTS) component such as the DAC-1412. 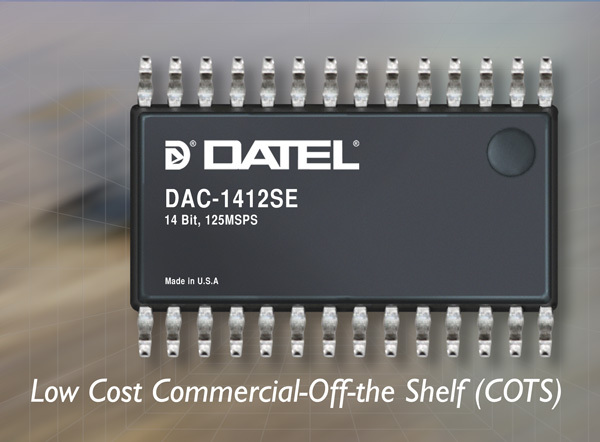 DATEL, Inc. has announced the introduction of the DAC-1412 series, a new line of Digital-to-Analog converters that offer 14-bit resolution and are housed in 28-pin plastic TSSOP package. It is offered in two enhanced Commercial off the Shelf (COTS) grades, DAC-1412SE (-40 to +105°C) and DAC-1412SM (-55 to +125°C). For the more demanding and ruggedized application, DATEL also offers this family of products as fully screened high reliability DAC-1412-QL and DAC-1412/883 models. These two MIL-STD models are offered in a hermetically-sealed ceramic package to protect the IC from the effects of moisture/outgassing and to isolate the IC from the stresses that may occur on the printed circuit. Please contact DATEL for more information on these models. In addition to our standard product offerings, DATEL is a leader in providing System-in-a-Package Solutions (SIP) for all special applications and Pin-to-Pin replacements for any existing or obsolete component.